As I mentioned on Friday, the updated edition of my book about Social Security is now available on Amazon, and the Kindle edition is free to download (here) today and tomorrow (11/30 and 12/1). The most significant revisions to the book deal with the changes made by the Bipartisan Budget Act of 2015 earlier this month (i.e., the changes to the deemed filing and voluntary suspension rules). There are also a few smaller changes, such as including 2016 figures when available. How Social Security benefits are taxed and how this affects retirement tax planning. If you know anybody else who would find the book helpful, please do mention it on social media or elsewhere. It would be great to see a large number of downloads in the next couple of days. Important note: If you have already purchased the Kindle version of the book in the past, attempting to re-purchase and re-download the book will only result in you getting the old edition again. Instead, you’ll want to go to the “Manage Your Content and Devices” page on Amazon, find Social Security Made Simple in your collection, and click the “update” button. Just in case you are new to Kindle books: It is not necessary to own an actual Kindle device in order to read a Kindle book. In addition to being readable on tablets or smartphones, they can be read on a normal PC or Mac using freely downloadable software (here). There is also no need for the “Kindle Unlimited” type of account that Amazon is promoting. 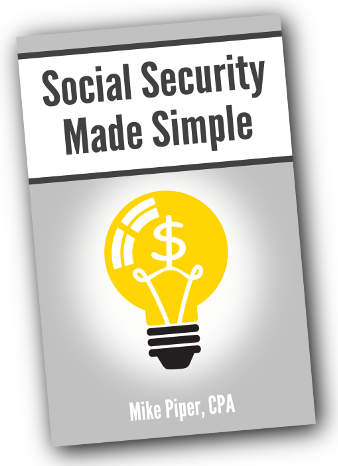 As of today, the new version of Social Security Made Simple is available on Amazon (here). It’s fully up-to-date, reflecting all of the changes made to Social Security by the recent Bipartisan Budget Act of 2015 (which we previously discussed here). Of note, however, is that you may want to hold off on purchasing a copy, because on Monday and Tuesday of next week (11/30-12/1) I will be making the Kindle edition of the book available for free on Amazon. How Much Employer Stock is Too Much? From a financial planning standpoint, the ideal amount of employer stock to own is “as little as possible.” If anything, an argument can be made for having a negative allocation to employer stock (e.g., by using various options strategies that benefit if the stock goes down). It’s true that many people have become mega-millionaires through ownership of employer stock (see: Microsoft). But many people have also experienced financial ruin through ownership of employer stock (see: Enron). Owning the stock of your employer is, on average, even worse, because it causes your employment and your portfolio to be exposed to the same set of risks. Getting laid off is a bad financial scenario. Getting laid off at the exact same time that your portfolio tanks can be a catastrophic financial scenario — definitely the sort of thing that it makes sense to go out of your way to avoid, if possible. That said, there are some cases in which it is more or less unavoidable to have a portion of your portfolio allocated to the stock of your employer. For instance, some employees are compensated with “restricted stock” that they cannot sell until certain conditions have been met (e.g., the employee has held the stock for a certain number of years). Alternatively, some employees are allowed to use a portion of their income to purchase employer stock at a significant discount, but they aren’t allowed to sell it within a certain number of months. If employer stock is a part of your compensation, there’s no sense in turning down free money. But as soon as you can sell such stock, it generally makes sense to do so. Social Security Decision Framework: When Should You Claim Social Security? Unfortunately, a decision tree would be pretty unwieldy because it would have to explicitly incorporate all the various factors that could be relevant (e.g., disability benefits that you mentioned, or a government pension, or a dependent child, or an ex-spouse). But, I do have a basic framework that I work from. Step 1: Determine which sets of rules apply to each spouse. That is, are either or both spouses affected by the new rules regarding restricted applications? Are they affected by the new rules regarding voluntary suspension? Step 2: Ignoring, for the moment, coordination of spousal benefits (or dependent child/parent benefits, if applicable) is there any particularly strong preference for the spouse with the higher primary insurance amount to start retirement benefits at a given age? In most cases, the answer to this question is, “yes, there is a strong preference for age 70.” As we’ve discussed before, when this spouse delays benefits, it increases the amount that the couple receives per month as long as either spouse is still alive, so it is usually very advantageous for this spouse to wait as long as possible. In some cases, however, the answer might be that there is no strong preference — or even possibly a slight preference for claiming early (e.g., because both spouses are in poor health or because the high-PIA spouse is in poor health and the low-PIA spouse has a government pension that would eliminate any widow(er) benefits via the government pension offset). Step 3: Ignoring, for the moment, coordination of spousal/child/parent benefits, is there any particularly strong preference for the low-PIA spouse to start retirement benefits at a given age? One of the two spouses is in poor health. On the other hand, sometimes they’re both in great health with family histories of longevity, and they don’t need the immediate cash flow, so there is a preference for waiting until 70. And in many cases (especially when both spouses are in approximately average health), there is no strong preference. That is, the decision for the low-PIA spouse (again, ignoring spousal/child/parent benefits) is approximately “actuarially neutral” — meaning that, on average, claiming at any particular age works out approximately as well as claiming at any other particular age. Step 4: Incorporate spousal/child/parent benefits into the analysis. Here we’re looking at the rough-draft plan we’ve developed in steps 2 and 3 to see whether it needs adjustment. First, we check to see the extent to which the rough plan allows for “free” spousal benefits for one spouse or the other via a restricted application. If there is a different strategy that allows for a greater amount of “free” spousal benefits, it often makes sense to adjust the plans somewhat. For example, in step 3 we may have decided that we’re indifferent to when the low-PIA spouse files for benefits. What we often find in this step is that it makes sense for the low-PIA spouse to claim somewhat early, if doing so allows the high-PIA spouse to receive spousal benefits while he/she delays his/her own retirement benefit until age 70. Second, we check whether the rough-draft plan gets in the way of desired child/parent benefit goals. For example, if the rough-draft plan is for both spouses to wait until 70, but that would mean a dependent child missing out on 8 years of benefits, we likely want to adjust our plan so that at least one spouse files earlier, in order to allow the child to begin receiving child’s benefits. Step 4 here is where a decision tree would get particularly messy, I imagine.